Wheelchair Headrest Can Be Retrofitted To Most Chairs. This wheelchair headrest is suitable for retrofitting to most wheelchairs with push handles up to 1” (25mm) diameter. It features height, width and angle adjustment and an adjustable padded headrest cushion. 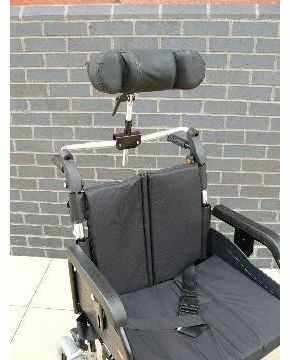 It is designed to help aid the posture and comfort of the wheelchair user. It should not be used as part of a restraint in a motor vehicle. We bought two of the headrests and after several outings in the minibus they have proved to be an excellent investment.